FROM CHAOS TO CONTROL! Sheepdog training as it really is “warts and all”! 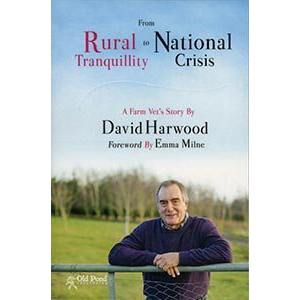 Professionally recorded, and clearly presented by sheepdog trainer Andy Nickless. FROM CHAOS TO CONTROL! 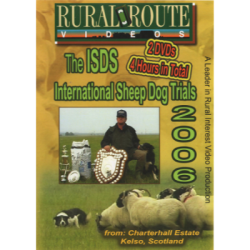 – “One of the best sheepdog training DVDs available”! Watch this five minute trailer. Unlike any other herding sheepdog training programme you’ve ever seen before, “First Steps in Border Collie Sheepdog Training” really does guide you through the difficult early stages of training, even if you’re a complete beginner. 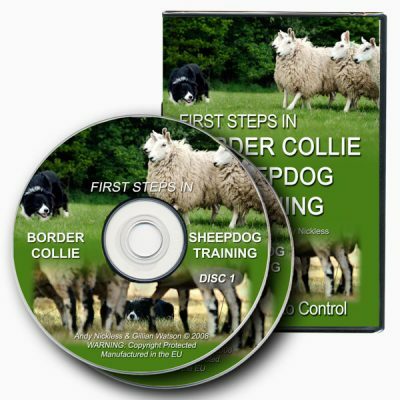 Professionally recorded and presented in a clear, easy to understand manner by sheepdog trainer Andy Nickless, from Worcestershire, England, this 2xDVD set demonstrates not only how to approach sheepdog training, but what to do when things go wrong (as they will for even the best sheepdog trainers). How and where to start training a sheepdog. Sheepdog training as it REALLY IS – you’ll see things going wrong, as well as right. It’s the first training herding and sheepdog training video to explain simple but vitally important factors such as dog and sheep behaviour, as well as how you can set up the ideal training area to make training as simple and convenient as possible. 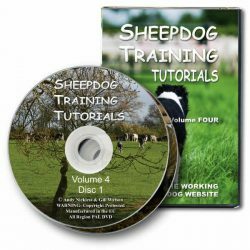 Whether you’re a hobby sheep keeper, smallholder, aspiring sheepdog trialler or farmer, this unique down-to-earth double-DVD clearly explains the natural instinct of the Border Collie Sheepdog and how (with patience, determination and simple preparation) it can easily be developed into a really useful working dog. 2xDVD set – All Regions Worldwide – we send the correct format for your country. Formats: PAL / NTSC – Run Time: 160+ mins – Widescreen. Introduction – The sheepdog, its selection and preparation for training. Sheep – Important things to know about sheep before you begin training. Training Area – Make training far easier by preparing the training area. The Handler – Get yourself ready for training. Start Training – We get two dogs started in the yard. Training in the Field – We start a third dog off, but this time in a training ring in the field. Then we continue the training of all three dogs up until the point when they can do an outrun and bring the sheep under reasonable control. The Sheepdog Whistle – Looking closely at how the sheepdog whistle works and how to use it.